KGI Securities analyst Ming-Chi Kuo is back with another report outlining his belief that Apple will launch a stylus as an optional accessory for the company's rumored 12.9-inch "iPad Pro". With the new iPad's larger screen, it will likely prove popular with enterprise and creative users who tend to have more need for a stylus and Kuo believes Apple will fill that need with an in-house solution. Given that it’s more precise than a person’s fingers, a stylus can be more convenient to use than the combination of keyboard and mouse in some cases. Therefore, we believe Apple’s stylus will improve the user experience of 12.9-inch iPad. Kuo believes the stylus will be an optional accessory rather than included standard with the new iPad, as the relatively expensive stylus would drive the base cost of the iPad too high. We don’t think all users will need a stylus initially. Coupled with its unfavorable cost structure, high selling prices may turn consumers off if the 12.9-inch iPad is always bundled with it. We therefore expect the stylus to be an optional accessory before sufficient user feedback is received. 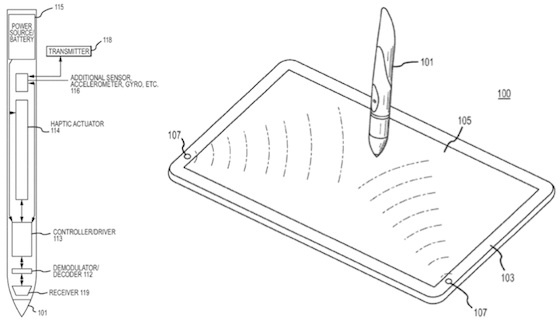 Looking at technical details of the stylus, Kuo predicts it will charge via a Lightning connector, believing a more convenient wireless charging solution would be too expensive and require difficult antenna design that Apple will likely forego initially. Kuo also believes the initial stylus model will not include a gyroscope accelerometer, but future models could include the component to support "3D handwriting" to allow the user to write on other surfaces or even in the air. Kuo believes Apple will launch this new stylus in the second or third quarter of this year, roughly the timeframe predicted for the iPad Pro launch. The company has filed for a number of patents related to stylus technology, with the most recently publicized one being a "communicating stylus" that would automatically transcribe handwritten notes into digital form. Funny, everyone was laughing at Microsoft when they included the Stylus with the Surface Pro, and now it seems Apple is following suit. Please dont say everyone, some of us were very happy with Microsoft including a stylus. I know I know, 'Apple does it better',,, 'now is the time, it was too early two years ago', etc.. but you have to give them credit that they were on to something with the idea of 'productive tablet' rather than a media consumption device. "You have to get them, and then put them away... yeuch!" Perhaps not on an iPhone as it's too small but on a tablet give people a choice! It's also worth noting that was 8 years ago and things have come a long way since then, there's now much more you can do with touch interfaces so a stylus which perhaps was not a good idea a number of years ago would be a good option now. You're acting like you would be forced to use the stylus. Back then, you were forced to use it with "smart" phones because using your finger would be annoying. If Apple did do this, I hope the pen would be pressure sensitive for digital painting and stuff. At last...bring it to the other smaller models as well! If this turns out to be true, the Samsung and Android fanboys are going to eat this up. I already can't take out my 6 Plus at work or on campus without hearing about how Samsung made big screen phones first. You have problems if minor teasing paralyzes you. "Samsung had a big screen first." "Oh my god, can't use my iPhone, have to hide it." Anyways... I can see Apple making a stylus.